Searching for your Italian genealogy has never been easier! Joe De Simone has been a leading source for discovering Italian genealogy for Italian Americans nationwide for the past 15 years, targeting the Campania region and the provinces of Avellino, Napoli, Caserta, Benevento and Salerno. An American who has lived in Italy for many years, Joe is at the source – Avellino, Italy – and knows his way around. He has searched Old World archives; civil, church, military, notary and catasto onciario records; and more to uncover the mysteries of many family histories. Joe has access to the most reliable Italian genealogy resources – the original ones – that aren’t available to most people. Joe has reached a point in his career when it is time to step back and, appropriately enough for a genealogy service, let the next generation continue his important work. His sons and wife now work with the De Simone genealogy service, led by his son Giovanni. Joe has passed his wealth of knowledge, his resources and his passion for helping people uncover their family histories to us, and we are committed to keeping his unique professional legacy alive. Italian-Americans are passionate about their heritage and history. We understand that because we ourselves are of Italian heritage. There are websites that can help you locate your Italian genealogy records, but how do you know if you are heading down the right path – or heading toward a dead end? The De Simones make it easy to build your Italian family tree and discover your Old World roots, as well as your connections to modern ones! The human touch that set Joe De Simone’s services apart from other genealogical websites and databases continues through this new generation. Italy is bursting with genealogical resources that date back generations, but even if you go to Italy yourself to search for your Italian genealogy, those sources can be daunting to try to sift through on your own – and that is if you can even gain access to them. We specialize in southern Italian genealogy, performing genealogical researches for the regions of Campania, Basilicata, Umbria, Puglia and Calabria and the provinces of Napoli, Caserta, Salerno, Avellino and Benevento. We have garnered the results to prove that you don’t need to do the searching yourself to build your family tree. Don’t get frustrated by searching endlessly online for your Italian genealogy records or relying on family word of mouth to build your family tree. 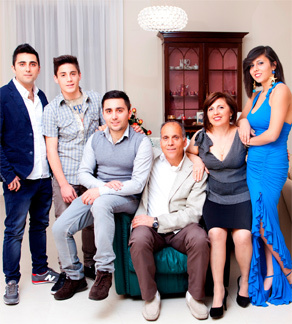 Joe De Simone is a professional genealogist who has all of the tools and expertise at his fingertips to help you learn about your family’s Italian history, and has passed them on to his sons and wife. Online genealogy websites are excellent resources, but they aren’t the same as working with experts in Italian genealogy to connect with your Italian roots. Start researching your family history – contact us!